Peter Lance has uncovered new evidence on the impact that convicted terrorist blind Sheikh Omar Abdel Rahman had on the recent Egyptian election. Emad Salem, the ex-Egyptian Army officer who went undercover for the FBI in 1993 and convicted Sheikh Omar Abdel Rahman and nine others in the “Day of Terror” plot to blow up the bridges and tunnels into Manhattan, learned on June 6th that Sheikh Omar, 74 who was sentenced to life in 1995 and whose communiqués to the outside world are supposed to be restricted, somehow, was able to issue a fatwa endorsing the presidency of Mohammed Morsi the Muslim Brotherhood candidate for Egyptian President. The day after the election, Salem learned that the blind Sheikh, who is supposed to get a single 15 minute “humanitarian” call a month to his family, was able to make a second call congratulating Morsi. 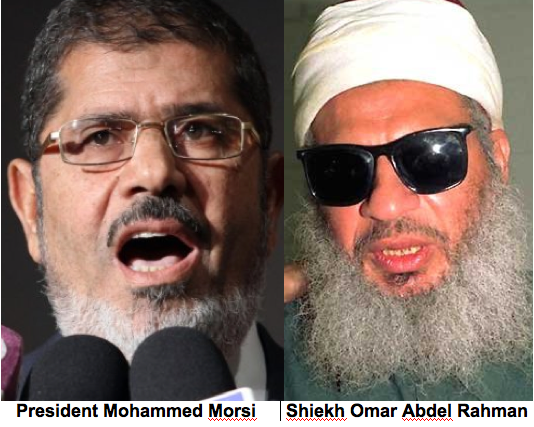 And within days of his election in a huge rally in Tahir Square in front of Abdel Rahman’s family, Morsi returned the favor by declaring that he would press for Sheikh Omar and other Egyptian terrorists convicted in the U.S. to be freed. As a measure of the significance of allowing Sheikh Omar, spiritual leader of al Qaeda and the accused head of Al-Gama’a al-Islamiyya to communicate to his followers from prison, the Sheikh’s former attorney Lynne F. Stewart was convicted in 2005 of conspiracy and providing material support for terrorists after she had smuggled messages from Abdel Rahman to his followers during her visits to him in federal custody. She was sentenced in 2006 to 28 months in Federal prison for aiding and abetting the Sheikh. In 2010 as a result of perjury at her trial and alleged lack of remorse, she was re-sentenced to 10 years and as recently as June 28th, the sentence was upheld by the Second Circuit Court of appeals. In 2009 after Salem had spent more than 14 years with his family in the Witness Protection Program, he reached out to Peter Lance and gave him the untold story of how he had infiltrated the blind Sheikh’s cell and could have stopped the 1993 World Trade Center bombing, but for the interference of a senior FBI official in New York. That piece, entitled ” The Spy Who Came in For the Heat can be accessed HERE. Salem, whose life has been threatened multiple times, now lives under a hidden idenity in seculsion. But he keeps close watch on the political events in Egypt and lectures regularly to U.S. intelligence officials. To visit Emad Salem’s website with more details on the Shiekh’s intervention in the Eguptian elections CLICK HERE. I’ve always thought, after reading Miller’s ‘The Cell’, that the REAL center of terrorist ACTIVIST hate was and still is the blind Sheik+the Egyptian sect+the black Nation of Islam (Farahkan) and it’s growth in the U.S. prisons in the world of illegal brotherhoods, and the hate. (NOT ARABS) In studying, I found there is an unknown pride of being the descendants of Solomon etc in a much more real way then we perceive or ever even think about. THEN there’s so many who have taken/ changed their names to a Muslim one. In the cell, the terrorists have Egyptian roots as collage students. Too many things to mention here. Seems they are always college students studying ‘city planning’ type stuff……Love your research! !